When I first learned that my husband and I were moving to Zürich, I quickly ran to the bookstore and bought a handful of travel guides on Switzerland. I began spending hours on the internet, reading articles, checking out expat blogs, as well as searching for Swiss cookbooks. 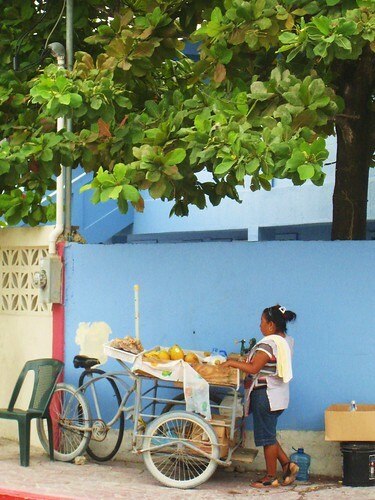 For our first visit here, I figured we would just roam the streets and get a feel for the city, without paying close attention to my lists of sweet addresses… yet. Nevertheless, I couldn’t help but notice that Schober, the one pastry shop I had underlined and bolded and put big stars all around it, was [gasp] closed. For good? For renovations? 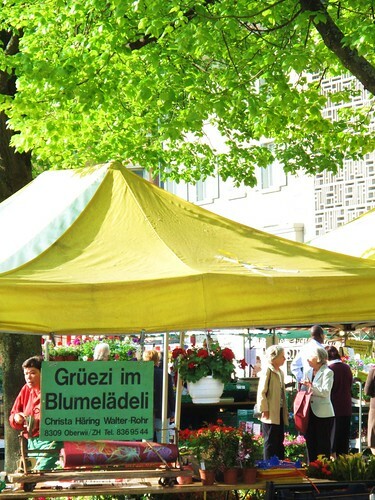 Once settled in in Zürich, I passed by every now and then to see if progress was being made. I peeked through the windows and saw the beautiful moldings, ceiling and chandelier, and just waited for this old-fashioned confectionery to be open again. Finally, in March of this year, after 4 months of renovations, it was back in business. Worth the wait? Absolutely. Only it was no longer Café Conditorei Schober, what I had read about to be Zürich’s most famous café with a rich history. The original 14th century building was turned into a confectionery and coffee shop by Theodor Schober, Sr. in the late 19th century. His son, Theodor Schober, Jr., took over until the age of 92, when the café was then bought and renovated by Teuscher, a name many of us rightfully equate with chocolate. But now it is Péclard, with Michel Péclard at the helm, alongside his charming manager Martin Egger. 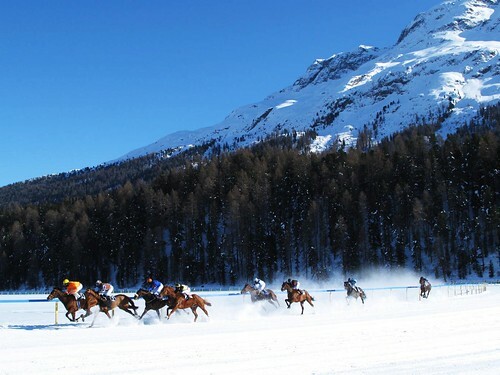 They present a fine mix of tradition and innovation, with an attention to detail in the esthetics and gastronomy. What was the first thing that caught my eye? 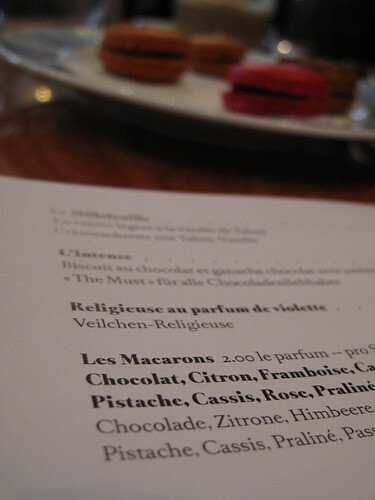 The macarons, bien sûr. 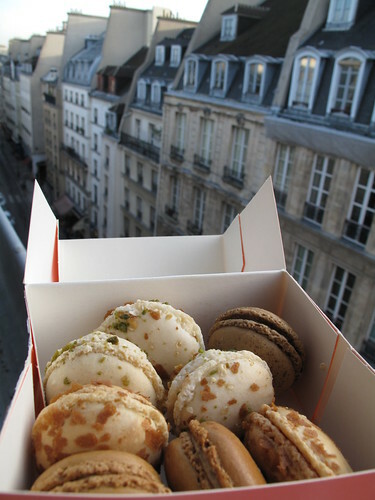 Real Parisian macarons. 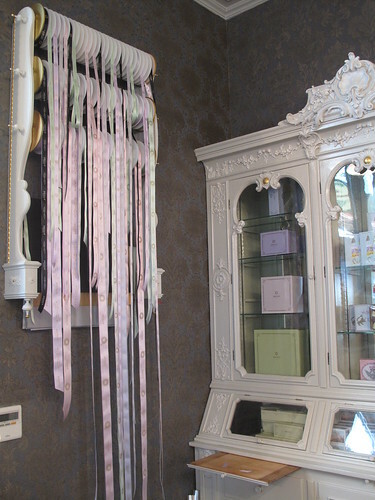 The boutique is unavoidably similar in feel to another luxurious patisserie we know and love, Paris’ Ladurée. 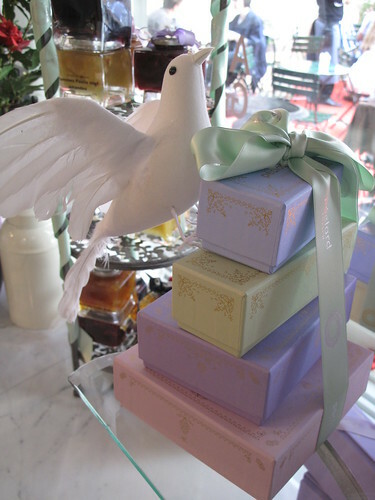 Boxes come in light pinks, purples and even Ladurée’s signature mint green color. I will admit being quite surprised by this. But you’re quickly reminded of your surroundings when you admire the artwork on the boxes, one motif being Zürich’s Grossmünster church (the box I have sitting on my desk here). Macarons come in the classic variety of flavors: chocolate, coffee, caramel, lemon, raspberry, blackcurrant, pistachio and vanilla, as well as coconut, rose and chocolate passionfruit. 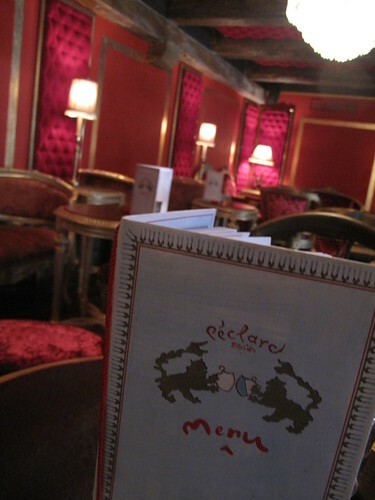 But Péclard is not just about macarons. 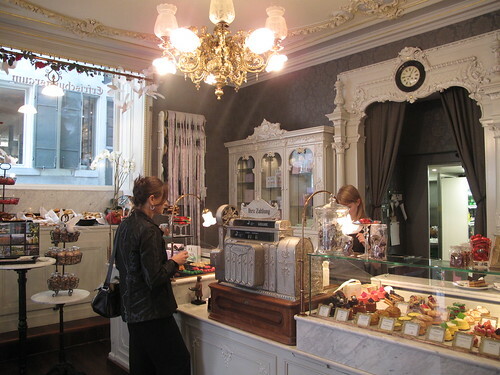 They are continuing the legacy of a traditional pastry shop and tea salon with a large menu of both sweet and savory treats (salads, sandwiches, soups, Flammekueche and quiche, etc.). You also have a large choice of atmospheres to enjoy it in, with several floors and diverse settings. Péclard and Egger spent a lot of time traveling throughout France, especially in Paris, gathering inspiration and ideas, not to mention all of the furniture and tableware for the different rooms. While preserving the original layout and lavish design, they put together what they call their “boutique coffeehouse.” There’s a small courtyard in front of the entrance for when the weather permits. 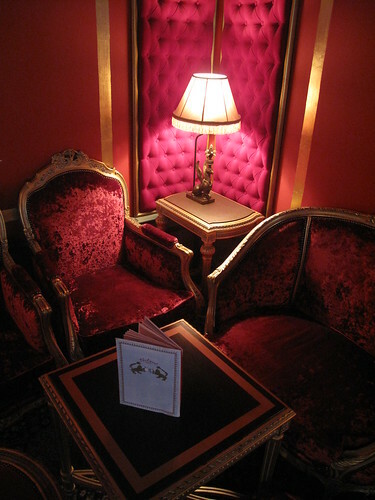 A classic tea salon is right off of the pastry shop and there is a more romantic French-style area upstairs with red, plush armchairs, turning into a piano bar in the evenings. Next up is a spacious bar facing beautiful wallpaper that was hand-crafted in the prestigious factories of Alsace. 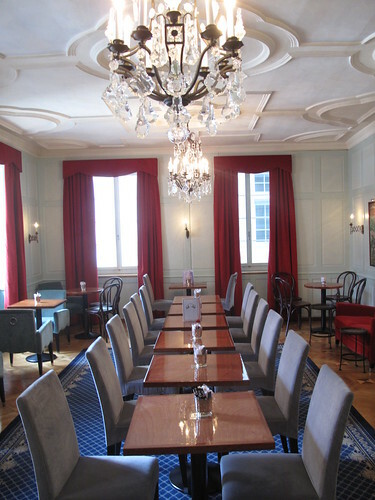 Lastly, there’s a more classic and formal room on the top floor. If you ask me, the very best import from France was Patrick Mesiano, master French chef Joël Robuchon’s celebrity patissier. His array of cakes is simply impressive. Elegant presentations and top quality to match. Chocolate lovers, look no further than the Intense (below right), whose name does not lie. Dark chocolate cream with dark chocolate ganache – it’s dense, rich… and intense. No surprise at my pick: the Fleur de Sel (bottom left) – dark chocolate mousse with a creamy caramel filling and my favorite French salt. 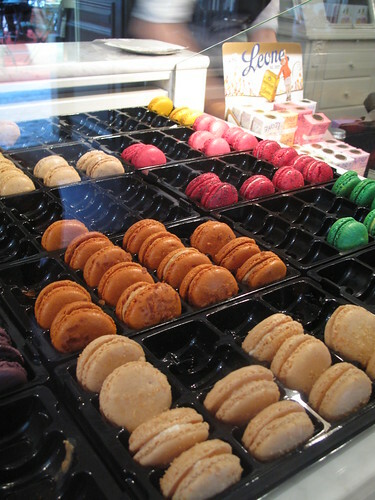 And of course, no tasting would be complete without a sample of those colorful macarons. Don’t leave without looking at the array of products at the entrance. There is a wall of jams from Le Comptoir des Confitures, in France’s Saint Jean du Gard, original combinations of fruit in sleek glass jars. 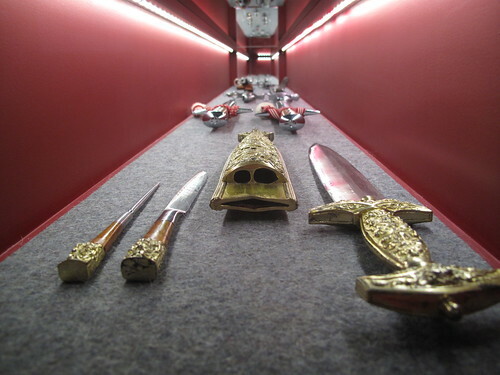 There are chocolates from Zürich’s well-known, century-old Honold (of which I am a fan) and plenty more temptations. There is also a large focus on tea, an impressive selection on offer coming from the gourmet institution across the street, Schwarzenbach. Last but not least, be sure to check out the cash register, an absolute beauty. I have always wanted to go that place, but just didn’t find the time when we were there. It was on my list of too visit places the next time we go back. I hope the hot chocolate is still just as amazing as I have heard it was. I love learning about these types of places, the history and architecture (not to mention, the goodies!) are great! jkiel, oh absolutely – while the sweet treats are in fact fantastic, I love it too when there’s such a rich history behind a place. The goooorgeous setting doesn’t hurt either ! 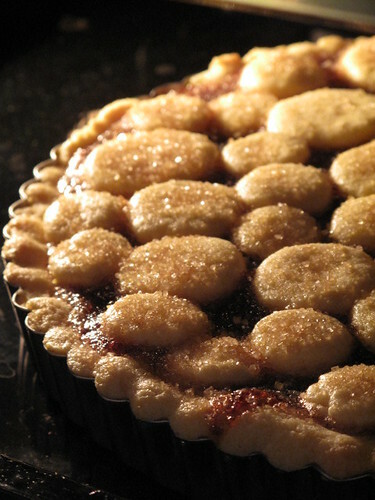 You should check out Schober’s website (link above), there’s a whole timeline about the confectionery’s history. If you don’t understand German, you can use Google translate. This place is so elegant. I would love to go for coffee and sweets!!!! Wow!!!! Definitely worth the calories that I would consume. I hope that will be on open when I do come to Zurich. You can taste the the cakes right from the computer. It can be like scratch and snif!!!!! 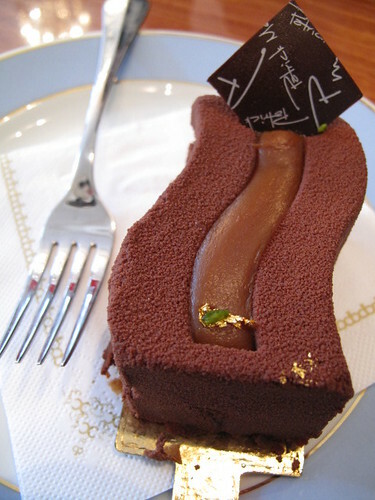 Lani, when you come to Zürich in October, you’ll be able to go everywhere – Péclard, Vollenweider, Sprüngli AND Ladurée. You ready ?! No scratch and sniff then. 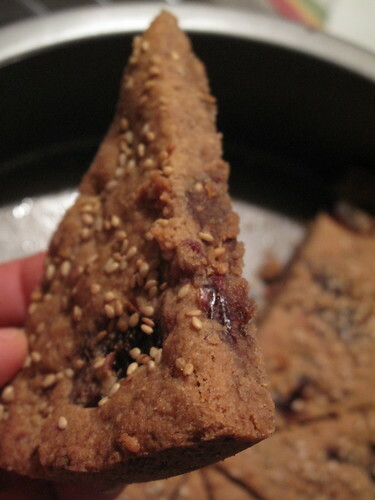 It will be — buy and eat ! haha! Julia, oh no, I am so sorry to hear you are sick. But I’m glad I could distract you a bit from all that with these photos. Try having a macaron or two – may not work as well as chicken soup, but it’s worth a try. No? katy, mmmm, I love Flammekueche. Authentic tarte flambées are fantastic. 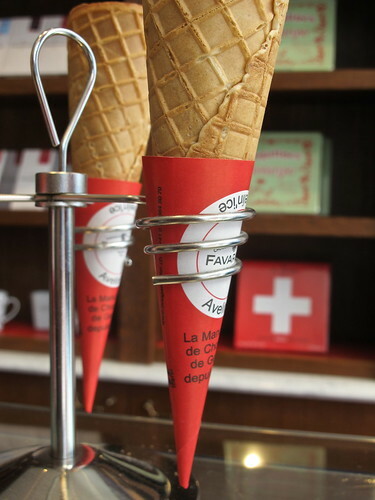 I had my fill for sure when we were in Alsace, and there’s a few places that make great ones here in Zürich too. Goethe Stuff is a funny name for sure! A top restaurant here is called Goethe Stübli, not Stuff ! Wow! What a beautiful place to have a cup of coffer with Macarons..
Wow, what a lovely looking little place. Couldn’t you just spend the whole day there? The macarons look so tempting. These little shops are what I really miss about Europe. Those cakes look divine!! love the decor too. Whoa baby! That place looks spectacular… and huge. I’ll be in Zurich soon, and you can bet they’ll be on my A list. Please say a prayer for me that they’ll have the “Intense” available. That’s got my name written all over it! Thanks for the fabulous recommendation… and as always, fabulous photography. 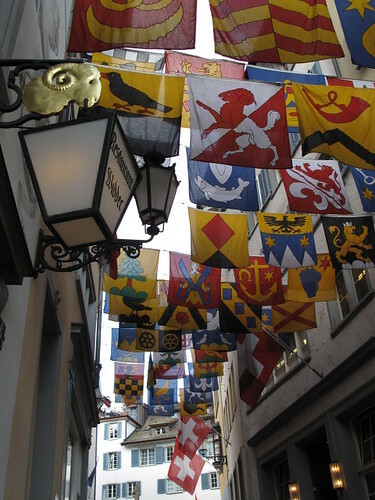 WOW… I really need to think about visiting Zurich. This place is incredible. Is it Zuber wallpaper from Alsace on the walls of the Coffeehouse? 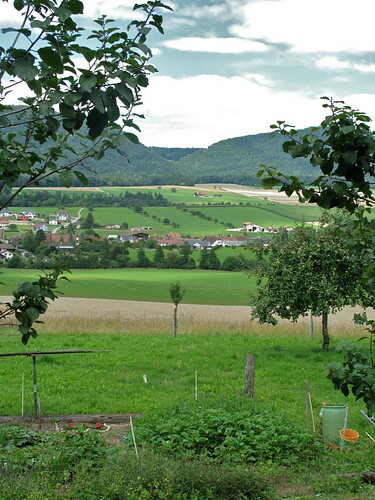 It’s my maiden name and I have done extensive research hoping to find my great-grandparents had a connection to the French Zubers (I hoped to find that I am French and that would explain my over-the-top love affair with that country), but found instead that we were right across the border in Germany. When I saw those boxes, I thought for sure, they were Laduree’s! But wow! 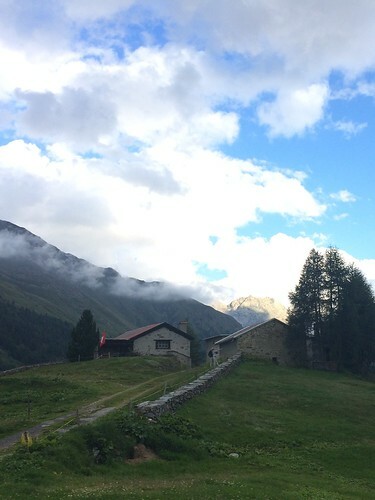 What a gorgeous place Peclard is! It looks like you got courtside privileges, too! 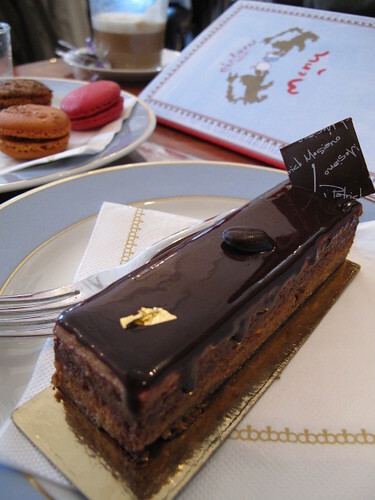 Wonderful photos and telling of Peclard’s luxurious patisserie. Bravo! 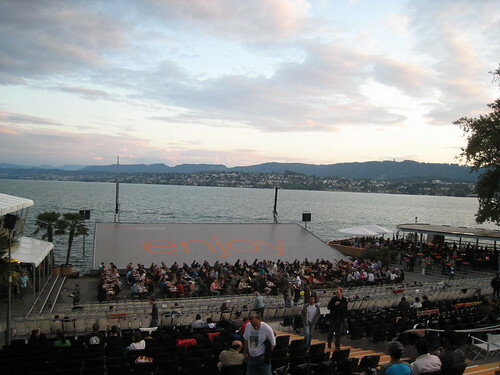 Eileen, a visit to Zurich is a must for you ? 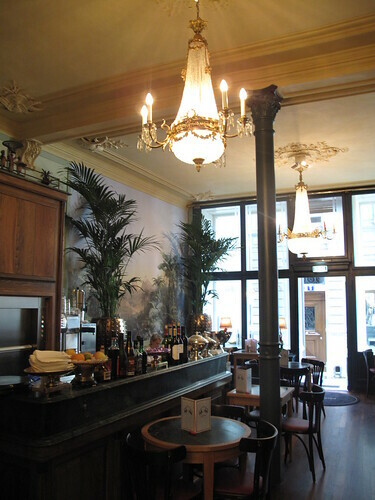 if not just to see the Zuber wallpaper at Péclard. Yes it is indeed Zuber (design: Eldorado) from Rixheim in Alsace. I spoke with Martin, the manager who said the following: “It is particularly nice at the Schober as you can admire it in its integrity, even with the beautiful blue sky as the ceiling is very high, no windows or cut outs etc.” Must be such fun tracing your family history – whichever side of the French/German border it falls!! Jen, haha, courtside privileges indeed! Up close and personal with those cakes! Thanks for the great comment. 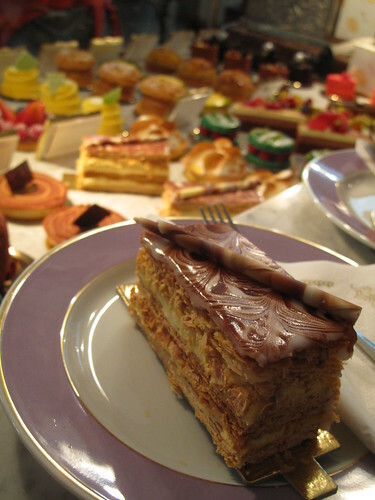 Scribetrotter, no jam in that mille-feuille, I assure you. (So come on over!) 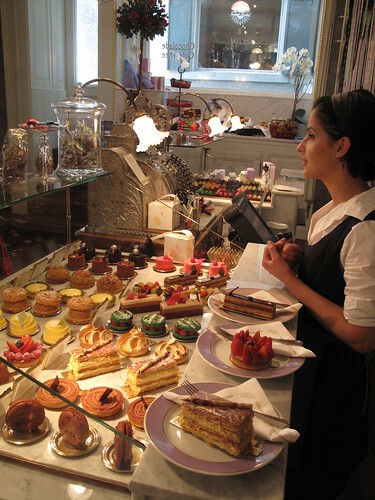 With a French pastry chef at the helm, you can be sure of that. Meanwhile, I don’t think I have ever seen a mille-feuille with jam in between the layers. I am awfully curious now though…! I love your site! I stumbled into it searching for Peclard. My aunt from Zurich brought me a box of macarons. It’s so heavenly. She usually brings the luxemburgli from Sprungli but now I’m a Peclard convert! I haven’t been to Zurich in 5 years. Will definitely add this exciting shop to my list! Thank you!! Had a cappuccino and cherry tart there this afternoon. An absolutely beautiful place – definitely recommend it to your readers. Your photographs capture its magic and atmosphere perfectly!